Opened on February 1 in Osaka and Tokyo, TWICE’s Candy Pop Cafe brings the album’s theme into a visual form. Not only is the interior decorated accordingly, but the food served here also reflects the album’s colorful and adorable images. TWICE’s new release in Japan drew attention with its music video directed by “Love Live” director Kyogoku Takahiko. 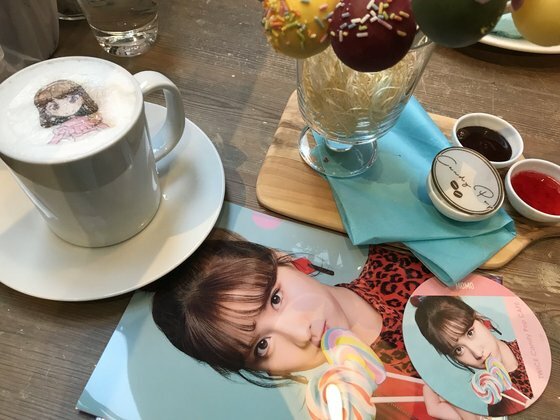 Candy Pop Cafe’s latte, which is decorated with anime character forms of TWICE members from the music video, is the most popular item at the cafe. In addition, fans can find various fan merchandises at the place. Each order comes with coasters with members’ faces printed and merchandises designed especially for the new single album are available for purchase. Those who wish to visit Candy Pop Cafe have to make a reservation on the website. Since the cafe is operated with a promotional purpose, it will stay open for a limited time. Both Tokyo and Osaka cafes will open until March 4. TWICE, with the help from three Japanese members Mina, Sana, and Momo, has been leading active performances in Japan even in the midst of decreasing popularity of K-pop in the country. Last year, the group even made an appearance on NHK’s year-end song festival as the only Korean group for the first time since 2011.